Yesterday, we reported that Telecom Regulatory Authority of India (TRAI) had received a total of 5.67 million MNP requests in February 2017. 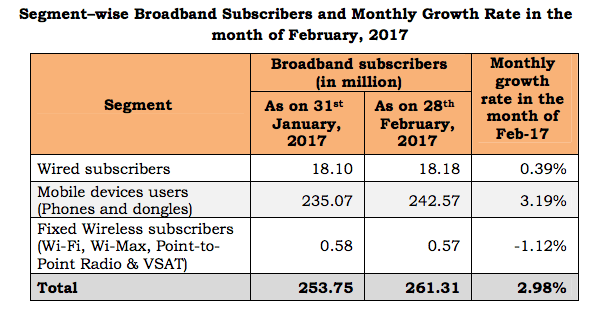 According to the data acquired by TRAI, the number of broadband subscribers (wired+wireless) increased to 261.31 million at the end of February 2017. The number was increased from 253.75 million at the end of January 2017 with a monthly growth rate of 2.98 percent. The data also states that the top five service providers constituted 86.76 percent market share of the total broadband subscribers at the end of February 2017. Reliance Jio Infocomm Ltd registered 102.84 million, Bharti Airtel got 46.69 million, Vodafone (32.06 million), Idea Cellular (24.32 million), and BSNL (20.81 million). That said, Reliance Jio, as expected is leading the wireless subscriber base. Coming to the wired broadband service providers until February 2017, the top five service providers included were BSNL with 9.95 million, Bharti Airtel (2.07 million), ACT Fibernet (1.14 million), MTNL (1.03 million), and YOU Broadband (0.62 million). As on 28th February 2017, the top five Wireless Broadband Service providers were Reliance Jio Infocomm Ltd (102.84 million), Bharti Airtel (44.62 million), Vodafone (32.05 million), Idea Cellular (24.31 million) and Reliance Communications (14.04 million). It’s pretty much evident that the users in India are still consuming the internet via a wireless device, either it is a mobile phone or dongle. Also, in the Fixed Wireless Department, operators have seen a downfall of 1.12 percent. In case you are wondering, fixed wireless devices include Wi-Fi, Wi-Fi Max, Point to Point Radio and VSAT. Also, the wired subscriber base has increased from the previous 18.10 million to 18.18 million with a rise of just 0.39 percent. The report also states that the number of active wireless subscribers in February 2017 was 1010.63 million. TRAI also says that the number of telephone subscribers in India increased from 1174.80 million at the end of January 2017 to 1188.55 million at the end of February 2017, thereby showing a monthly growth of 1.17 percent. Total wireless subscribers (GSM, CDMA, and LTE) increased from 1150.45 million at the end of January 2017 to 1164.20 million at the end of February 2017 with a monthly growth rate of 1.19 percent. Are the jio unrecharged sims still working? Yes. Only Jio to Jio calls working and Internet at 2g speeds. BSNL is lying about subscriber base. People are fed up with them . Soon they are on the way to become history if they do not mend their ways.